Archangel Zadkiel's name means 'the righteousness of God' and is the angel of mercy and compassion; which could be because of his role in stopping Abraham from sacrificing his son Isaac as an offering to God. 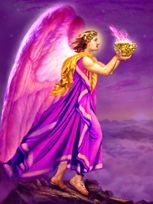 Archangel Zadkiel can help you to release feelings of judgement and unforgiveness towards others, and assist you with feeling more compassionate to yourself and others. Call on him if you need his help. He is also known to work with Archangel Michael in releasing negative energies and replacing them with faith and compassion, so he could also be seen as a healing angel. He is also know to assist with the function of our memories, so if you are going to need to be able to memorise important information, say for an exam, presentation or interview; or maybe where you have left a missing object, ask him to help you. Archangel Zadkiel's aura is deep indigo blue. The crystal associated with his energy is lapis lazuli, so hold or wear a piece of this beautiful crystal so that you can enhance your connection with him. Shop for Lapis Lazuli.